USB People - Customisable USB Drives Shaped Like People! USB Flash Drives in the shape of People! Welcome to USB-People.co.uk, the most complete resource of USB People on the web! If you've never seen USB People before, let us give you a quick overview. Simply put, they are USB Flash Drives in the shape of people. They are available with capacities from 64MB to 8GB and most models can be completely customised to fit in with your company uniform, current promotion or anything else that you wish to publicise regarding your company. Currently, there are 8 different variations of the ever-expanding USB People range as shown below. Take your time to go through each of them to find the one that best fits your promotion. There are standard styles to choose from for each of them, but as stated before, you have the ability to completely customise the design if you so wish. If you require advice, further information or anything else relating to these USB drives, call 01274 854996 to speak to one of our people, or submit a phone call request and we'll call you as soon as we can. The product that launched the range and the one with the most set styles to choose from. Much the same size and shape as the originals, but with extra weight and quality. Laser engraved with your logo. Domed design give these flash drives a feeling of solidity and quality and look great with it. The babies of the range, the head alone is the USB chip with the body forming the cover. The body is the same as the originals, but the head has a very precise and tactile finish. The heads on these are much rounder than on the originals, allowing for more realistic formation of helmets. Presentation is important - you can design your own packaging to accompany your newly-designed drive. Request a callback. Enter your name and telephone number in the boxes below and we'll call you as soon as we can. Alternatively, submit a quote request on one of the product pages or give us a call on 01274 854996. Have an idea for a USB Person but don't have the expertise to translate it into a design? We can help! 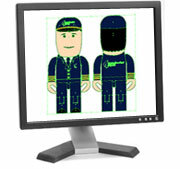 We offer a full design service for your USB Person ranging from suggestions on logo placement to fully bespoke designs. Select the option when requesting a quote or mention it when you receive your callback.